Joining two crochet pieces with another row of stitches creates a different look from the other seams. Instead of working through the double thickness of two crocheted pieces, you work back and forth between them, usually on the right side of the piece. The row between the two pieces can be as narrow as a single stitch, or it can be wide and lacy. You can use this joining method to connect motifs when making a shawl, to add interest to the side seams of a garment, or to join panels when crocheting an afghan. Lay the pieces side by side on a flat surface, matching stitches across the adjacent edges that you’re going to join. 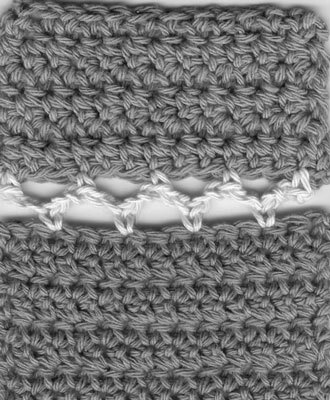 Insert your hook under the top 2 loops in the designated stitch on the first piece, chain 1 (ch 1), single crochet (sc) in the same stitch, and then chain 2 stitches for the joining row. Insert your hook under the top 2 loops of the designated corresponding stitch on the second piece, yarn over (yo), and pull the yarn through the stitch. Yarn over, draw the yarn through the 2 loops on your hook, and single crochet the stitch complete. Chain 2, insert your hook under the top 2 loops of the designated stitch on the first piece, yarn over, and pull the yarn through the stitch. Yarn over and draw the yarn through the 2 loops on your hook. Chain 2; then repeat Steps 3 through 6 across the row to the ending point designated in the pattern. Fasten off and weave in the ends with the yarn needle. 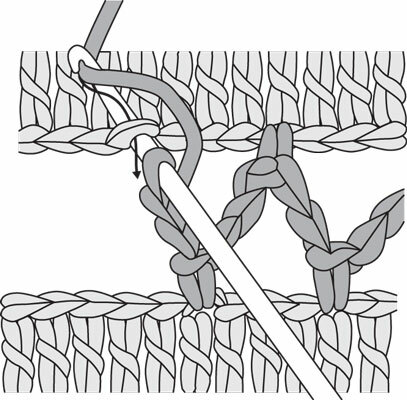 Check out the following figure to see a completed seam made with a row of stitches. A seam made by joining with a row of stitches.